Insights - Are A-share small caps liquid enough for a beta approach? Are A-share small caps liquid enough for a beta approach? Size works in A-shares, but for this article we'll put that aside and focus on implementation feasibility. While MSCI's A-share inclusion is limited to only the top ~220 stocks, many investors prefer China's small caps and new economy stocks. In fact, a quick glance at any active A-share strategy will identify a number of stocks in the top holdings that are outside of MSCI China A and CSI 300. Why is that? The rationale is simple: perception of hidden opportunities due to lack of research, assumed linkages to innovation and growth (think new economy), lower upfront costs, lower impact from fiscal stimulus on/off policies, lower regulation and higher volatilities, etc. Similar to the rationale for small caps in nearly every market! In fact, nowhere is this preference for small caps stronger than among China's retail investors, who account for over 80% of market turnover. 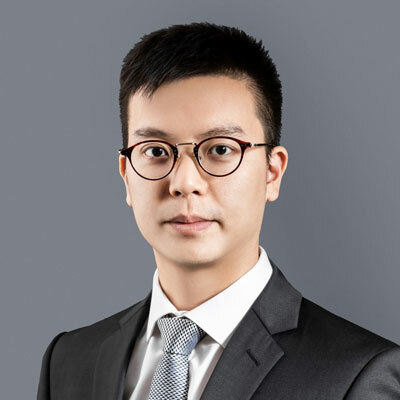 Based on a study covering 64.2 million A-share trades by 6.8 million active Chinese investors, Chinese individual investors prefer small caps, growth stocks, high beta stocks, and perhaps counter intuitively liquid and state owned stocks (Lilian Ng and Fei Wu, 2005). First, there is always a concern about stock suspension in China onshore markets. In particular, some investors might still remember that a combined 1,400 companies listed in Shenzhen and Shanghai were suspended from trading during the sell-off in mid-2015. How does the suspension mechanism work and what is the current situation among the mid-to-small-caps? Second, are mid-to-small caps liquid enough for accumulating or disposing a position in a short period of time without creating much impact to the trading price? Trading suspension in A-shares mainly come from either (i) limit-up and limit-down rule, or (ii) the voluntary trading suspensions requested by the listed companies themselves. Today, A-shares are still subject to the 10% daily upper and lower limits, i.e. whenever a stock rises or falls by 10%, its trading will be halted for the rest of the day. Again, this is not unique in China. Even New York Stock Exchange and Nasdaq have these limits, but with a shorter trading halt such as 5 minutes. Voluntary trading suspension, on the other hand, may be controversial as they are simply initiated by the listed companies themselves. That’s why Shenzhen and Shanghai stock exchanges both announced regulatory changes to limit voluntary share suspensions. The limits are a maximum of 3 months for companies involved in major asset restructuring and 1 month for companies conducting private placements. Companies should even hold a board meeting to decide the arrangement if it involves a longer horizon. These new rules are meant to curb stock suspensions at will and are designed to protect the interests of investors. Besides, the upcoming MSCI inclusion may help improve the situation in the medium-term as any A-share suspended for over 50 days in the past 12 months would not be eligible for index inclusion. If we look closely at the suspension situation in mid-to-small caps, represented by CSI500 Index, only 16 out of 500 mid-to-small cap stocks are suspended. That accounts for only 3.2% in terms of number of stocks and 4.0% in terms of index weight. For reference, the suspension ratio among large caps, represented by the constituents of CSI300 Index, is even higher. It accounts for 5.3% in terms of number of stocks or 4.1% in terms of index weight. Conclusion: suspensions are decreasing and are not a material issue in the mid-to-small cap portion of the A-share market. In order to answer the liquidity and cost question, it's easy to start with reviewing the daily trading volumes of the stocks themselves. The weighted average daily turnover is about RMB 266 million for mid-to-small caps. 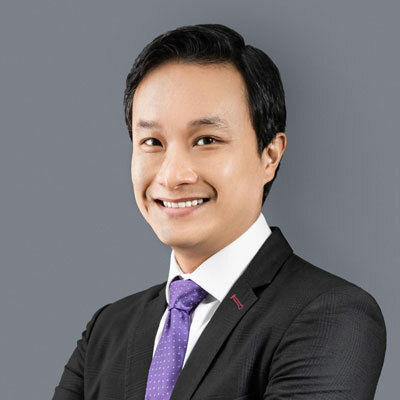 What does this mean for an institutional investor seeking to allocate USD 100 million among 10 mid-to-small cap A-share stocks? Execution can be done in a single trading day with the trades accounting on average for ~25% of the daily turnover of each stock. The following chart shows the distribution of both mid-to-small caps and large caps in terms of average daily turnover in the past 30 days. 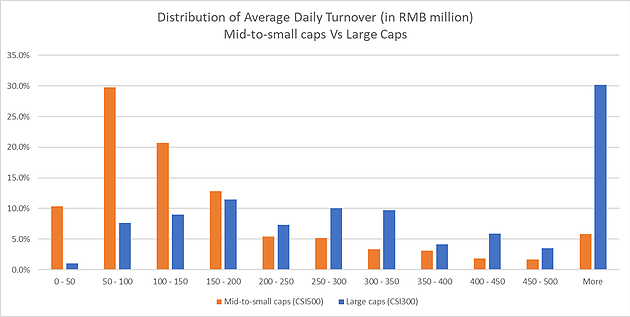 Almost 90% of mid-to-small caps have an average daily turnover of RMB 50 million or above. Of course, the absolute level of daily turnover does not match the large caps' figure. That said, the turnover to market capitalization ratio is significantly higher for mid-to-small caps. In addition, when comparing to the US market, the daily turnover of China mid-to-small caps is 1.8x greater than US mid-to-small caps, e.g. USD 38 million versus USD 21 million (see table below). Given no shortage of Russell 2000 beta strategies, it's surprising that there isn't a greater proliferation of usable tools for China small caps. They are in fact, highly implementable in terms of trading liquidity when compared to global small cap markets. But what about cost? Similar, to turnover, China mid-to-small caps fare better than their equivalents in the US. In the US, large caps trade on average 3 bps wide, whereas mid-to-small caps trade 26 bps wide (table below). In China, the bid-ask of smaller stocks is not much worse than that of large caps. The starting point is worse than in the US - 10 bps on average for CSI 300 stocks. But the mid-to-small cap space is only 3 bps worse with an average bid-ask of 13 bps. That's 50% narrower than US mid-to-small caps! Conclusion: China mid-to-small cap turnover and bid-ask spreads are on par with, if not better than, global markets. Our review above shows that trading suspensions are an issue that is being dealt with while liquidity and turnover costs are actually better than most casual observers expect. Given that China is not yet in most investors' portfolios, we tend to forget that with USD 7.9 trillion outstanding and USD 1.2 trillion in June turnover, A-shares are the 2nd most liquid market in the world after the US. At Premia Partners, we believe that A-shares are liquid enough for useful and innovative beta exposures. We plan to roll out 2 smart beta strategies later this year and in anticipation of questions around liquidity, have calculated a few interesting stats around capacity. The details are below comparing our approaches to CSI 300 and ChiNext, but in short, China's capital markets are immense and there is plenty of liquidity to deliver differentiated beta net of costs. Our approach blends the cost efficiency of beta with the excess return of active strategies. Stay tuned for more details as we get closer to launch or contact us to discuss should you have specific questions.